The fonts are: Blood Gutter from http://www.1001freefonts.com/horror-fonts.php and Edward's handwriting font from http://bellaandedward.com/funfonts.php. LOVE the layout! Thanks for sharing. I really enjoyed your "Twilight" scrapbook pages. 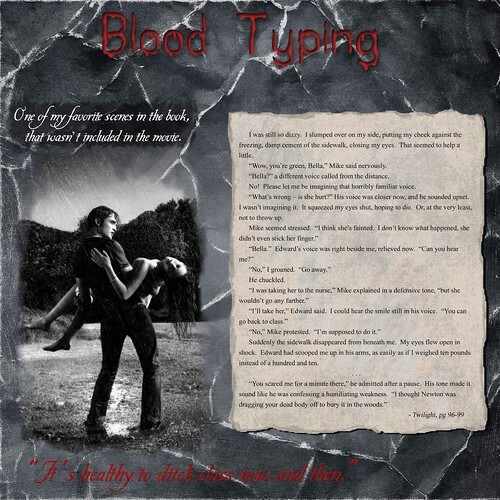 Especially, " Blood Typing". I too wished it was in the movie as it introduced you more to Edward's feelings. What a shame they didn't see it important enough to use. It is my favourite chapter in Twilight. Thankyou for sharing.